The Jupiter 38', big sister to the well-known Jupiter 31', is a completely new design, conceived by the Jupiter staff and designed with the assistance of renown naval architects of Donald Blount and Associates. The Jupiter 38' has been developed to satisfy boaters who require a larger vessel which incorporates the performance, features, and comforts of the 31'. The Eurostyle motor well is designed to accommodate either twin or triple outboard installations. A 53 gallon livewell is located in the standard prep center, giving anglers more fishing room in the cockpit. The transom is designed to accommodate a unique fold-out optional stern seat. There are seven insulated deck compartments: two 104 gallon macerated fish boxes, two six foot storage boxes, one 14 cubic foot compartment forward of the console and two large overboard draining lockable rod storage boxes under the forward seating area. All hatches are gasketed and dogged. Port and starboard side lockers offer planned storage for life jackets and safety gear. The bow area designed for optional concealed windlass and spare anchor storage. The Jupiter 38' is stylish yet rugged. 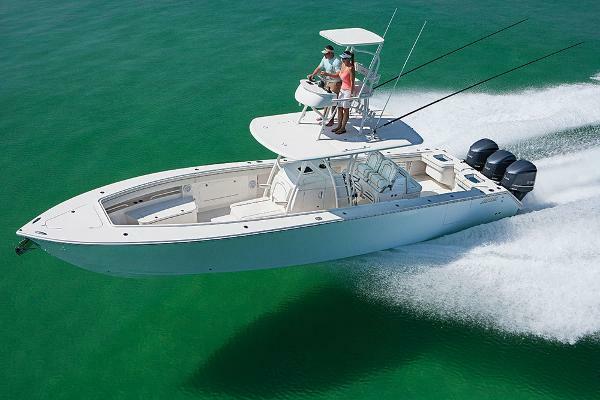 The wide beam, centerline fuel tanks and ample freeboard aft make this an extremely stable and comfortable boat. Jupiter’s dependable out of this world performance is standard.